After a week of going to the beach, visiting family, and doing a little shopping therapy, I made some time to take my two nieces to Ko'olina Beach for a mini portrait session. We had to rush there before the sun when down and was determined to get some amazing shots. It was pretty funny working with my family because although my older niece, Kamalei, thought she knew how to pose, it was a good time for her to practice. Kamalei is a beautiful girl who is a junior this year at Anuenue High School. She dances hula for Halau O Kamuela and is a very bright student. In the summertime she attends Punahou High School's summer program where she is active in her academic studies. She will be graduating next year and hope to attend college in the mainland. 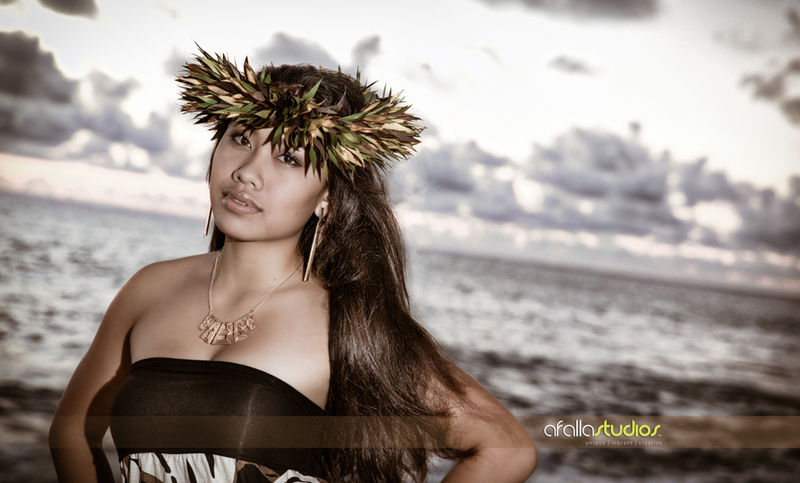 Kamalei is also one of our premier Senior Couture Ambassador models for AfallaStudios. I decided to filter this photo to pay homage to famous Hawaii photographer, Kim Taylor Reece. My other niece, Napua, is a young lady of 13 years of age. She attends Anuenue also and is a beautiful girl both inside and out. Between the two girls, Napua is much more natural in front of the camera even though she was a little nervous because she didn't know what to do when her uncle is aiming a camera lens at her. Napua is a very talented artist and reminds a lot of my late sister, Mayleen. Overall, I had a great time with these two. And it was great practice for me as well. If you are a high school senior that lives in Hawaii, don't hesitate to contact us for a portrait session. We plan to fly back in August so booking your sessions now will reserve your spot on our schedule. Aloha!